Saiwa Swamp, the smallest of Kenya’s national parks and reserves, is a delight. Covering only 3 square kilometers, it’s located in the west of Kenya, 150 miles (240 kilometers) north-west of Nairobi. It’s only accessible by foot and very few tourists visit the park. 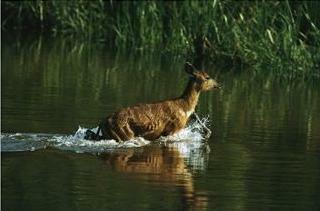 The park was originally set up as a protective habitat for the threatened sitatunga antelope. One can ask whether that was successful, as poaching brought the number of antelopes down from 70 at the park’s founding to 20 at the last count. Other animals are present too. The park consists of grassland, swampland, riverine forests and acacia trees. There are footpaths and duck boards that meander through the swamp. The flora consists of swamp and forest vegetation. It’s an all-year round destination. The sitatunga antelopes can be watched best from the 4 (rickety) observation platforms. There are 3 observation platforms on the west side of the park, and one on the east side. From there you can spy on the animals undetected. The best time to watch wildlife is in the early morning, right after sunrise, and to a lesser extent the late afternoon. The antelopes are extremely good swimmers. When swimming, they totally disappear in the water with only a small piece of their nose above the surface. Other animals present include bushbucks – easily distinguishable from the antelopes because the former flee when seeing humans –, blue vervet monkeys, De Brazza monkeys, black and white colobuses, Cape clawless and spot-throated otters, genet cats and serval cats. Finally, the park is home to about 370 bird species, many of which are very untypical for Kenya, including turacos, kingfishers, the black and white casqued hornbill, the blue headed coucal and crowned cranes. Walking, bird watching and camping. There’s a public campsite in the park on a beautiful spot by the river, with good facilities and two bandas. Camping is $8 per night for adults. Eleven kilometers outside the park, Sirikwa Safaris manages a fine campsite and farmhouse rooms with a good if somewhat expensive restaurant. Excursions can also be booked from there. The airstrip of Kitali is at 22 kilometers from the Saiwa Swamp NP. There’s only one gate (Sitatunga Gate). As mentioned, the park can only be accessed by foot. It has no roads. Vehicles can park at the gate. Entry fees for non-Kenyans are $20 for adults, $10 for children.